Wedding cakes are always romantic, pretty, and totally oogle-worthy. I have seen and made many of wedding cakes. But there a few designers have the ability to create something that is truly awe-inspiring. Here are three of my favorite wedding cake artists: Nadia, Maggie Austin, and Steve from Hey there cupcake. Each one of them is unique in their design for different reasons. In today’s post I’d like to introduce each one of them and share with you why I think they inspire me. Nadia & Co is well-known for her painted cake style. She incorporates these main elements in her designs: botanic, colors, and Rococo style. Botanic: Painted flowers are widely seen in her work. She also combines 2D painting with 3D sugar flowers, to create more dimension. Color: She uses either of two extreme color schemes in her designs. Soft and Pastel, which is non-traditional wedding color but also Bold and Dark, depending on what her client chooses. Rococo style: Nadia utilizes a lot of swag design inspired by the Rococo period in France. They are elaborate, intricate, and are basically pieces of art. I met Nadia and was fortunate enough to take a class taught by her during my time at the Bonnie Gordon College in Toronto, Canada. What she taught us was that she finds mixing dusting powder and alcohol such as vodka to work best for painting on cakes. I always find inspiration in the details of her work continue to be impressed by her creation. Maggie draws a lot of her inspiration from mother nature and a lot of her work is created to mimic the what’s found in nature. 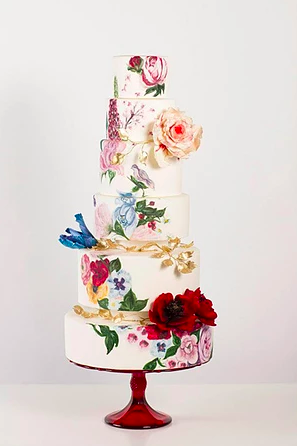 Besides her well-known sugar flowers, she is also known for these three cake decorating techniques: ruffles, stained glass and bas relief cake. 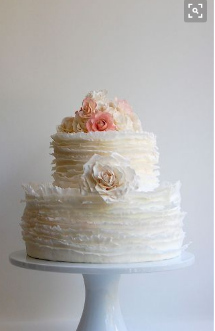 Ruffles: The ruffles in combination of real flowers is a signature look of her cake creations. 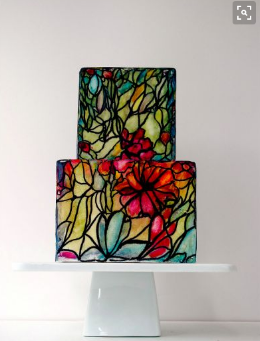 Stained Glass Cake: As a stylistic element in her designs, she incorporates "Stained Glass". Bas Relief Cake: As explained below, Bag Relief is a famous technique which I am a huge fan of. I would like to apply this technique in the future in my own work. *Bas relief is a term borrowed from the art of sculpture and refers a pattern that is raised up from the surface of a piece of art. 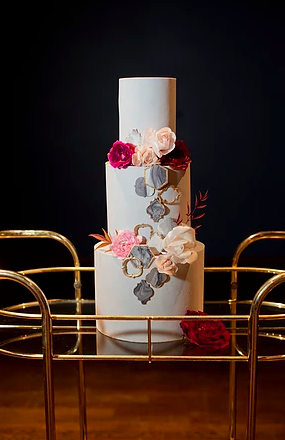 Bas relief as used in cake decorating creates a wonderful illusion of the design having been”carved” from the cake surface and is especially effective when the same colour is used in both the background and the bas relief pattern. Image source: Hey There, Cupcake! Wafer paper is a kind of rice paper and comes in different colors. Stevi’s designs are colorful, fun, modern and trendy. 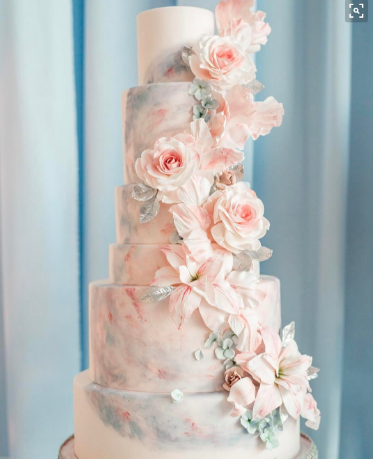 I like her approach in combining many different techniques and style in each of her cake design. What’s most interesting about all three cake artist is that none of them comes directly from a pastry background. Nadia has an art/painting background. Maggie was a ballet dancer in her last professional life before becoming a cake artist. Stevi used be an interior designer. In the cake design world, there is so much room for creativity. Having a non-traditional background is almost an advantage. I love the fact that all three artists use their past profession/expertise in some way in their current cake design.